Beautiful door. Thats a lot of doors with such a hard wood. The price was right. Well done. That is striking. Well done. What kind of joinery? 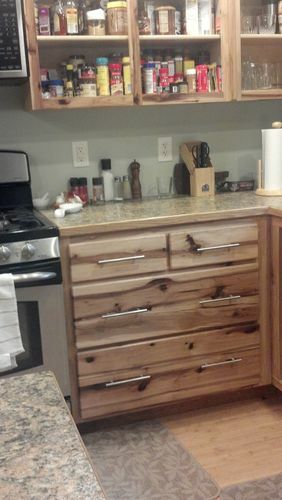 Love the grain in the hickory especially the way you matched the grain on the kitchen drawers. Nice – very nice! What beautiful work. What makes Hickory so difficult to work with?